Volunteer Appreciation Week is a great time to acknowledge our incredible Master Gardener volunteers in King County. Our Master Gardeners gave over 22,000 hours in 2014, serving nearly 50,000 King County residents at the plant clinics, gardens, speaking events and outreach programs. Thank you for not just doing, but doing more, and doing it with creativity and expertise. Congratulations as we celebrate our 42nd year in the WSU Extension program, a national program that began right here in King County! 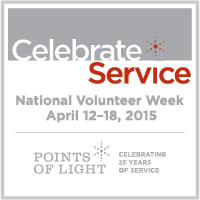 Points of Light has been celebrating National Volunteer Appreciation Week since 1974. This week is about inspiring, recognizing and encouraging people to seek out imaginative ways to engage their communities. Thank you, Master Gardeners, for making such a big difference in our community and our county.